Since 1992, when she dropped her first album, What’s the 411?, Mary J. Blige — the Queen of Hip-Hop Soul — has released 11 albums. Her most recent came in 2014, The London Sessions, and at least eight of them have gone multiplatinum. Blige has won nine Grammys after 30 Grammy nominations. She’s a savvy business woman, and her work in film (I Can Do Bad All by Myself) has been highly acclaimed. She has often been called the most important female R&B artist of the past 25 years. So, why hasn’t anyone before now ever written a book about her, her music, and her impact on popular culture? 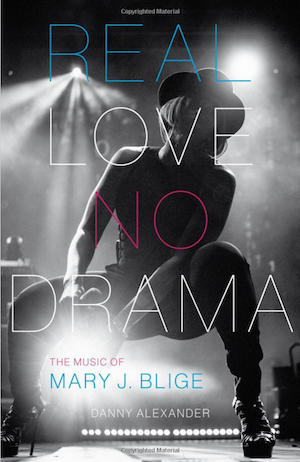 Fortunately, in Real Love, No Drama: The Music of Mary J. Blige (University of Texas Press), music journalist Danny Alexander has remedied this situation and given us a captivating, absorbing tale of the woman who’s become an icon, whose music burns brightly because it’s been burnished in the fires of her own confrontations with injustice, inequities, and lack of love. Not just a music biography, Alexander’s tome cannily draws on interviews with her friends and associates. He weaves in his own take on the ways that her albums reflect her struggles or triumphs at the time they were recorded. The book is even more interesting and complete than a straightforward biography. Alexander illustrates, through this deep exploration of her work, the ways that Blige emerges as an artist who on took control of her musical vision early on, who saw clearly the ways that she could give voice to women’s struggles. Blige emerges as an artist never afraid to look away from life’s stark realities, but always in search of love. Alexander’s book does what the best of these sorts of books do: it gives us a glimpse into the life of the artist while at the same time illustrating the ways that those moments in her life have contributed to her art. He also provides incisive and perceptive critical summaries of her albums in an appendix. I recently had the opportunity to chat with Danny Alexander about his writing process and ths new book. Henry Carrigan: What led you to write this book now? Why did you turn to Mary J. Blige and her music? After 25 years, it’s apparent that Mary J. Blige has uniquely maintained everything that I loved about that movement, and the quality and consistency of her output speaks for itself. Put another way, when I was asked if I had a proposal for the American Music Series, absolutely no other artist made sense. From my perspective, Mary J. Blige is the most significant artist to emerge in the past quarter century. From where does the book’s title come? I have to give credit to my wonderful editor, Casey Kittrell. We wrestled with all kinds of titles, based around various Mary J. Blige titles, but the two that came up most often were “Real Love,” her first big crossover single, and “No More Drama,” the climactic single that signaled the end of the tragic-youth chapters of her story and the beginning of her more-grounded adult work. Casey called me excitedly one morning and bounced it off me. I immediately loved it. This is Blige’s vision in a nutshell — love as an active principle, grounded in the conditions that surround it, coupled with an ethos that refuses to romanticize the emotional struggle. I was at a book talk followed by a hip-hop/poetry event in Chicago this past weekend. As you no doubt know, the city’s been wracked by violence over the past few years, but at both events we were engaged in real conversations about what we were feeling, practicing, listening, and thinking hard, and finding — surprisingly easily — empathy. I felt so happy, particularly standing in a basement listening to a DJ laying down beats for hip-hop MCs, slam poets, singers, and every other kind of poet. One young white woman simply read from her journal. [I found] my title described the activity we were engaged in. You didn’t have a chance to interview Blige. How do you think you would have written the book differently if you’d had the chance to talk to her? I got what I could — from reading every interview I could find and talking to musicians from early in her career, who were comfortable talking for an unauthorized project. I had enough examples of her distinctive collaborative style in the studio that I had some satisfying questions for that journalist. That said, I would have had more if I could have talked to her, because I would have explicitly asked her how she worked. That was the main thing I would have liked to talk with her about. What would you describe as the key stages in Blige’s evolution as an artist? She emerges in 1992 with her producers calling her the “Queen of Hip-Hop Soul,” a weighty mantle she’s managed to carry ever since. However, for two albums, she is seen as Sean Combs’ (Puff Daddy’s) protégé. She breaks away from Combs in 1997 and makes remarkably eclectic music through the remainder of that decade. In 2001, Blige’s “No More Drama” is the turning point, where Blige transforms from a long-suffering artist to a determined survivor. In some ways, the past 15 years have been about how an artist makes grown-up, relatively settled (she met her husband at the start of this era) music. Her last big pop successes came a decade ago with 2005’s The Breakthrough, which ties the nuance of everyday struggle to some of her most overtly political material. She rode that wave with two years of singles, but the past decade has seen her increasingly free herself of genre limitations — exploring heavy rock and American standards. That said, even when Blige sings Stephen Foster, there are elements of hip-hop and Pentecost in the mix. This book is not only about Blige but also about you. How did you change and grow as a music writer, as a result of your encounter with her? Blige rode the crest of a wave of women musicians who helped me hear in new ways. This has to be a little different for women than men, but I’d say most young men start off listening to music that helps them forge their own identity, generally by artists who are like them in some way. As a white male, I would be foolish to think I know what it is to be a black woman living in America — particularly a woman who grew up in tough, segregated projects. But Blige has taught me volumes about that experience, and she has taught me, by extension, what is universal about the human experience. She has taught me about those nuances I mentioned earlier, as she seeks ways to get something new out of this Sunday’s relationship reckoning versus last Sunday’s relationship reckoning. There are many other nuances in her work, from the way she comments on a sample to the way she bites on a phrase. Most importantly, she has taught me to be bold in reaching beyond strict social boundaries. The single most satisfying aspect of promoting this book is the conversation I get to have with people from very different backgrounds. The most moving conversations I have had are with women who grew up with Blige’s music and told me this book spoke to them in profound ways. There’s a leap of faith in Blige’s music that gave me permission for my own leap of faith. In every instance I’ve connected, I feel blessed and deeply appreciative. What will readers be surprised to learn about Blige from your book? If I’ve done it right, I hope they’re surprised to see new layers of her artistic ambitions. She’s a collaborationist — drawing on others to help her do her best. In an individualistic society like ours, that isn’t always recognized as the strength I think it is, but I have attempted to show the depths of interconnection — between musicians and ideas — in her work. There’s also a very relatable vulnerability and an admirable generosity that aid in that collaborative process. On the other hand, she emerges as a very determined visionary. She’s very much conscious of the role of class, race, and gender in her work, and she draws lines when and where she must to maintain her integrity and power. What themes/lessons would you like readers to take away from your book? I have a long list of themes I’ve written inside the jacket of my copy. I’d like people to think about the historical role of women in music and why, after significant gains, women have lost ground again. I’d like readers to think about why writing about women tends to focus more on their personal lives than [does] writing about men. I see Mary J. Blige as a unique synthesis of everything that makes me want to write about music, yet 25 years into her career, my book is the only full-length volume that’s been written about her. I’d like readers to think about that as well as why she seems to have been aged off of radio after 2007, despite making some of the catchiest, radio-friendly music of her career. I’d like readers to think about the ways Blige’s career challenges hip in-group assumptions about what’s important, whether they come from club-goers or academics or academic club-goers. Finally, I’d like readers to think a little about something Zora Neale Hurston wrote over six decades ago in “What White Publishers Don’t Print.” She argued that the portrayals of black [people] in our culture are only commercial if they are extraordinary or “quaint.” In some way, I think this idea might be extended to many communities, particularly those living under some form of oppression. The stories we tell are either of a stereotyped, perhaps quirky, ordinary existence or we like to talk about the one-in-a-million. Blige has always reached for the real life she lives and connected it to the real lives of her fans. In doing so, she’s emerged as a character who maintains a devoted fanbase of black women around her age, certainly, and that’s an important achievement. But she also reaches so much further than that, and the fact that a white Okie male seven years her senior wrote her story as perhaps his last shot at a music biography, that says something about the possibilities in art and music about which we don’t talk nearly enough.